Watches are an indispensable tool in modern day cultures for measuring time. The first clock was invented in Babylon 3.5 thousand years ago. These were a sundial which consisted of a stone dial with a rod set in the middle, the shadow of this rod indicated the time. These clocks accurate and reliable, but they have one major drawback, they can work only in daylight. The Incense clock, a traditional Chinese timekeeping device consisted of an incense stick being burnt. The time taken for the incense stick to burn was known which meant the time could easily be calculated. The first self winding wristwatch system was invented by John Harwood in 1923, and since has gone from strength to strength. Watches are no longer worn as just a a functional device but as a fashion statement too. Apples sales started to peak with the iPhone 6 with stock prices falling since due to less phones being sold. It needed a new product to please investors. At a time where consumers had peaked in interest about smartwatches, Apple released the watch. The Apple watch, a square format Apple watch, a device that connects to the iPhone via bluetooth to make life a little easier for it’s owner. Glances were meant to be able to give the user all the information they required about their notifications. Fitness was to be tracked to try and benefit the users health, this was done with sensors embedded within the device that was able to track all types of information, heartbeat was just of one them. Not just a tech device, Apple targeted the fashion market too with this product. Three different ranges for the product, sport (£259-299) ready for fitness with sweat resistant materials Watch (£479-949) made from stainless steel and coming with a variety of different style bands to match the watch. Edition (£8,000-£13,500) a luxury model made from 18 Carat gold and different strap materials including leather. What is interesting about this range is that the while the style differs, the product and it’s function are exactly the same, with everything that the most expensive gold watch is capable of being available also on the cheapest sport model. Apple claims that the reason they made the device rectangular rather than a tradition circle shape was that it wouldn’t be able to display the information without cutting it off at the edges. It can be argued that the Apple watch was a failure, Apple refuse to announce sale figures and reports find that the company currently sells as little as 20,000 watches a day, just weeks after it’s release (Mail Online, 2015), compared to the 818,329 iPhones sold every day (Kingsley-Hughes, 2015). So why did it go so wrong? There are no answers currently and this is where I will speculate and give my opinion about what happened with the watch. I believe that the watch was too complicated and aimed too high too soon. Applications weren’t stored locally on the watch and were loaded from the phone directly meaning that any function of the phone took a while to load. It used a a full colour palette meaning the the systems battery, which was already small, would be drained within a day. Questioning existing users and potential buyers gives the consensus that the ui of of device is not brilliant, the main screen has lots of little icons squeezed together to display the apps (Shown Below), and that there is room for improvement. Firstly, if I would change to a conventional round form factor, this would attract the majority of the people I questioned regarding the watch. I would scrap the external apps and use the watch for a few simple functions that it could achieve really well. It would be able to aid with fitness, music, contacts, e-mail and social feed, anything more complex requires more than a simple ‘glance’ and should be done on the phone. Pulling the majority of the colour from the ui is important, this mean the device could use the different colours as detail to amplify meaning, green becomes good or accept, orange being a neutral colour, red becomes alerts or warning. The watch would be capable of three simple modes, time mode which displays the time and customised notifications, fitness mode displaying the heartbeat calories being used and speed of which user is running and finally music mode offering simple controls over the song currently playing. The above image shows how the watch face really uses a simple single colour palette to amplify its’ design with the red appearing for just the notifications on the device. This shows how the cut down menu doesn’t need to be difficult and complicated, it’s simple and flat design allows the user it easy and quickly understand the layout and access they desire straight away. The above Image combines the entire social feed, just like Blackberry devices do in an easy to understand way. Checking if you have new messages has never been easier. This shows how the simplistic design of the watch face makes the information on the screen a little easier to understand rather than being cluttered with too much information the neutral orange has been placed around the edge to help the user to understand the progress they have made. This image shows music mode, with basic controls over the song choice and volume, it is set up to ensure the user can control their music easier than taking their phone from their pockets. The above image displays the music selection app, using the alphabet around the exterior of the screen it means the centre can display more, the actual artist. This means there are quick ways to jump to characters within the alphabet or just scroll through artists as you would wish. This shows how simple it is to pick a song once you have selected an artist, this is important as it doesn’t confuse the user with an over complicate layout, just a simple list will suffice here. Finally, this mockup displays the different screens the user has been through to get to their current screen, this means instead of hitting the back button the can push harder on the device and it would show the user every screen allowing them to choose how far back they would like to go. While this is a simple concept, I believe Apples’ watch user interface is what let it down, and that it is trying to do too much at once. A simpler device with five main functions that can be handled really well is much better than a device can try and fail to achieve a far greater amount of functions. This would set the foundation for the watch, allow people to see the watch as a true fashion item and allow Apple to build upon it for it’s next generation. Kingsley-Hughes, A. (2015). Nine iPhones sold every second | ZDNet. [online] ZDNet. Available at: http://www.zdnet.com/article/nine-iphones-sold-every-second/ [Accessed 17 May 2016]. Mail Online. (2015). Apple Watch is a FLOP: Sales have fallen 90% since April, report finds. [online] Available at: http://www.dailymail.co.uk/sciencetech/article-3152514/Apple-Watch-FLOP-Sales-gadget-fallen-90-April-report-claims.html [Accessed 17 May 2016]. This essay looks at the developing phone market and where the future lies for the Apple iPhone. Apple has seen 13 years of financial growth, but as of April 2016, they announced their first revenue decline since 2003 (Thielman, Neate and Hern, 2016). This could suggest that the phone has reached maximum capability and upgrades are no longer required. The following looks at area where apple could develop it’s phone to enable continued capital growth. Google has invested in R&D of a modular phone, which are now commercially viable in an increasingly environmentally conscious world. The LG G5, the first commercially available modular phone has just been released. This is paving the way for a new type of phone, a more customisable phone. Apple have always been known for not giving users the ability to customise their phones, their computers and phones are sealed to stop users from upgrading parts inside. This is proven by the fact they have a recycle system with a machine that takes apart the phone and deconstructs it part by part so that Apple can use the parts again in new phones, or sell them to external companies to be used in other products. Since Apple offers it’s customers payment plans for the iPhone itself without the data, so they can pay a monthly fee and upgrade to the next one comes out, this makes perfect sense. iOT (Internet of Things) is an idea that everything should be connected to the web for the user to be able to control more easily. HomeKit is a prime example of where Apple could build more function within its’ iPhone. “HomeKit is a framework for communicating with and controlling connected accessories in a user’s home.”. This framework Apple has produced is the beginning of something huge, the IoT (Internet of Things) are a collection of devices that are designed and developed to connect with each other on a network. McKinsey & Company estimate that the industry will be worth between $200-$300 Billion by 2025 (McKinsey & Company, 2015). This technology paves the way for a truly connected home that is able to combine all of the data about the person who lives there to be able to create a much better and easier life for the homeowner. When all the devices in the home talk to each other they are able to create schedules for temperature, lighting, cooking, locks and so much much more in relation to any of the residents schedules. This can mean opening the curtains, switching on the radio, preparing a coffee and ensuring a warm temperature all before you’ve even woken up. Siri, the personal assistant accessed by voice with “Hey Siri”, is already a very useful tool and can accomplish many tasks like setting an alarm, reminding you to do something when you leave home or make a call for you. While Siri is already very useful, imagine the potential when the iPhone has built in everything I have discussed in this essay. Statements like “Hey Siri, I’m going on holiday, give me directions to Leeds airport, Shut down the house and send Mike access my garage for next Tuesday”. The current iPhone has the ability to track Parkinson’s disease progress, help diagnose autism and predict seizures when paired with an Apple watch. When the iPhone is able to track the data of it’s user, that data can also be shown to a doctor for feedback. Imagine a world where the phone extends life and even prevents death. The original telephone (from the Ancient Greek τῆλε (têle, “afar”) + φωνή (phōnḗ, “voice, sound”) was a means of voice communication over distance. Telephones were static, and in the early days public phone boxes requiring the insertion of coins were the commonplace means of speaking with someone at a distance, often connected by means of a switchboard operator. The advent of cell phones or mobiles radically changed the face of communication. The other great communication imperative was the Internet. The combination of features of both into the iPhone (Steve Jobs, co-founder and CEO of Apple, stated at the debut of the iMac that the name derived from the excitement of the Internet combined with the simplicity of Macintosh, and the use of the lower case i has subsequently been taken to imply the Internet connection on other devices) has created a powerful instrument which is much more than a simple “voice to voice” machine. The telephone has developed from a static handset in a public phone booth (some remain, particularly near known suicide sites) to the brick-sized clumsy mobile and subsequently to elegant slim machines which are themselves status symbols. Perhaps the shape will see further development: already wrist phones may be seen; with the exponential increase in micro-surgery procedures it is not impossible to imagine mobile phone circuitry to be inserted under the skin at birth and apps and further modifications added as the owner learns control. Touch sensitivity is a growing issue nowadays: what about mental control of one’s internal phone? Use of the mind alone to operate computer systems is becoming an increasingly viable possibility (Falcon et al., 2016) and a brain-computer interface is already established. Last year, the Brown researchers reported testing a prototype of a fully implanted interface, with the electronics housed inside a titanium can that can be sealed under the scalp, though the device is not yet commercialised (MIT Technology Review, 2016). At the moment, “display” is becoming increasingly sophisticated. Consider if the display were directly to the retina, the voice transmitted directly to the inner ear. Falcon, A., Irina, A., Pataki, D., Duvall, A., Jamaluddin, A., Jamaluddin, A., Duvall, A., Jamaluddin, A., Jamaluddin, A., Khaliq, A. and Jamaluddin, A. (2016). 8 Mind-blowing Gadgets You Can Control Just With Your Brain. [online] Hongkiat.com. Available at: http://www.hongkiat.com/blog/brain-controlled-gadgets/ [Accessed 16 May 2016]. McKinsey & Company. (2015). Unlocking the potential of the Internet of Things. [online] Available at: http://www.mckinsey.com/business-functions/business-technology/our-insights/the-internet-of-things-the-value-of-digitizing-the-physical-world [Accessed 16 May 2016]. MIT Technology Review. (2016). A Brain-Computer Interface That Works Wirelessly. [online] Available at: https://www.technologyreview.com/s/534206/a-brain-computer-interface-that-works-wirelessly/ [Accessed 16 May 2016]. Thielman, S., Neate, R. and Hern, A. (2016). Decline in iPhone sales leads to first revenue decline in 13 years for Apple. [online] the Guardian. Available at: https://www.theguardian.com/technology/2016/apr/26/apple-iphone-first-revenue-decline-13-years [Accessed 16 May 2016]. Yoshida, E. (2015). Apple had the most product placement in the films of 2014. [online] The Verge. Available at: http://www.theverge.com/2015/3/4/8147063/apple-transformers-age-of-extinction-product-placement [Accessed 16 May 2016]. Since 2007, Apple has changed the size of the screen on the iPhone. 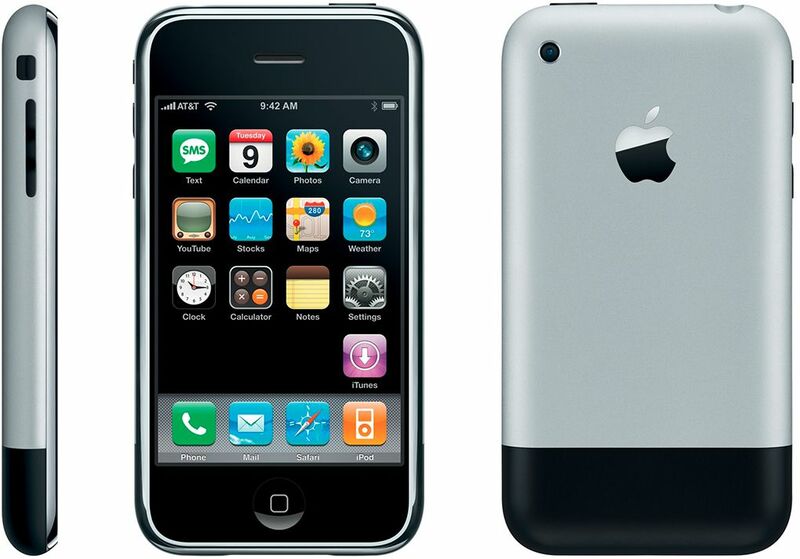 The first two iPhones had a 3.5-inch screen with a 320×480 pixel resolution. The iPhone 5 changed the screen once again to better suit widescreen content. The screen was now 0.5″ bigger at 4″ with a resolution boost up to 1136×640. The iPhone saw the biggest change to screen size with the introduction of two entirely new screen size models. The iPhone with 4.7″ screen size and resolution of 1334×750 and the iPhone Plus with as 5.5″ screen size and a resolution of 1920×1080. There is also proof that Apple has considered changing the design with this patent it owns. Another Idea is that instead of using the aux port instead it would use the lightning port which would also mean higher quality audio, something that it’s music service could easily provide. This is something Apple alreadly supports and there are few companies that provide this tech to consumers, Philips is one example. This makes sense too as Apple made an $3.3 Billion acquisition of Beats by Dre in 2014. A company famous for selling headhones, most of which are wireless are now wireless, a change that has happened since the acquisition. The last thing to consider is would Apple would really do this? I believe the answer is yes Apple as they are famous for adding new technology to their devices and removing the old. Apple was the first company to remove the floppy disk drive from the computer and introduce usb to the masses back in 1998 with the first ever iMac. Then they decided that removing the Firewire ports and CD Drive would be best for their users CD’s were no longer needed when they released the iMac in 2011. While this is a brilliant idea that not only saves the planet and puts the power back in the users hand, it is unlikely of Apple to put this in the phones that the consumers will buy. The reason for this is that they like to maintain complete control over their devices. On the other hand Google has funded Project Ara which is a modular built phone due to become available to consumers in 2016. Since the very first iPhone the home button has always been an important part of the user interface. This is something that could change in the future. With the invention of new technology like 3D touch there are new methods to communicate with the screen therefore removing the home button and creating a gesture is something that could easily happen. 3D Touch is a technology that apple has implemented into it’s currently generation of iPhone to add a new dimension to the user interface. It now means there are three levels of force that can be applied to the screen that will offer the user a different experience, these are a tap, gentle press and hard press. A great video explaining it is below. There is also technology researched by Disney to complement the 3D touch that would give tactile feedback to the user based on what was on the screen. This means the device could imitate the feel of an object and bumps and can also add resistance to the screen. Haptic Feedback is something Apple have alreadly implemented into the iPhone to allow the user to understand when they have pressed harder for the 3D touches. This is just the beggining, using 3D touch more thoroughly throughout the operating system and creating different ways of doing things using these techniques will change the way people interact with their phones forever.